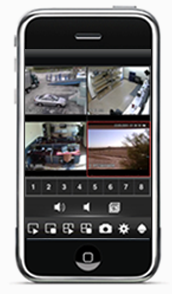 Watch live surveillance video streams - fast & simple. One of the most convenient characteristics of cell phones is their small, modular, portable size. With the new technologies enabled in these handy instruments, such as internet connections and cameras, I propose a service that enables cell phones to receive images from web cam like devices. This service is a portable security camera viewer, so you can keep an eye on things while you’re away. A camera (or set of cameras) sends its images via satellite to a corresponding cell phone (or cell phones), so its images can be viewed anytime, anywhere. This service is a convenient way to keep surveillance on things, and does not require any additional equipment other than a camera and a phone. No video tapes or bulky TV monitors are needed; you can just turn on your phone and see the video. This new, easy, convenient method of supervision will give you peace of mind while you’re away. No one will ever suspect you’re viewing anything with its discreet, tiny viewing device that is cleverly disguised within your cell phone (as your cell phone).